Note: This information is outdated. From 2014 to 2016, BitMEX had both quanto and inverse offerings. To simplify our products, we moved to inverse-only. For up-to-date information, see the XBT Series Guide. BitMEX‘s goal is to provide the most complete Bitcoin derivatives product offering. There are currently two types of popular structures, quanto and inverse. The XBTUSD swap product uses the inverse structure, and the XBTU16 contract uses the quanto structure. 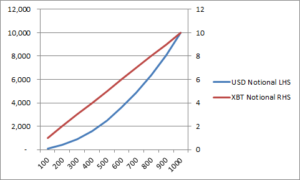 The XBTUSD is an inverse contract because it is quoted as XBTUSD but in actuality the underlying is USDXBT or 1/XBTUSD. It is quoted as an inverse because most traders in the Bitcoin community are accustomed to seeing Bitcoin quoted as the home currency. This product is suitable for traders who need to lock in a USD value of Bitcoin. If you were to receive $100,000 of Bitcoin in three months, you would sell 100,000 XBTUSD contacts to lock in the $100,000 value. A quanto is a type of derivative in which the underlying is denominated in one currency, but the instrument itself is settled in another currency at some fixed rate. This chain is suitable for traders who have Bitcoin and want to earn Bitcoin by correctly predicting the future price of Bitcoin. 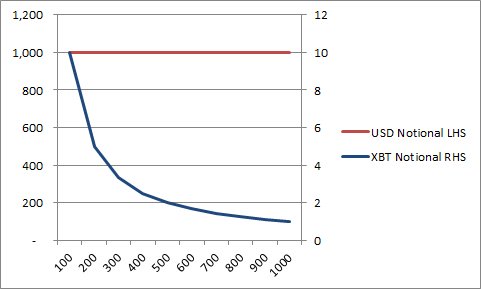 The chart above displays the USD and XBT exposure of being long 1,000 XBTUSD contracts as the XBTUSD spot rate changes. The USD exposure is constant at $1,000; however, the XBT exposure changes in non-linear way because you are taking the inverse of the XBTUSD price [XBT Value = 1/Price * $1 * Contracts]. The next chart shows the margin implications. Assume you bought 1,000 XBTUSD contracts at a price of $500. The XBT value of those contracts is 1/$500 * $1 * 1,000 or 2 XBT. Being a cautious trader, you deposited 2 XBT as margin. You assume because you have fully margined the position that you cannot go bankrupt if the price drops. The chart above shows that you are incorrect. 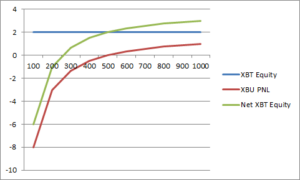 The blue line shows your 2 XBT of equity. 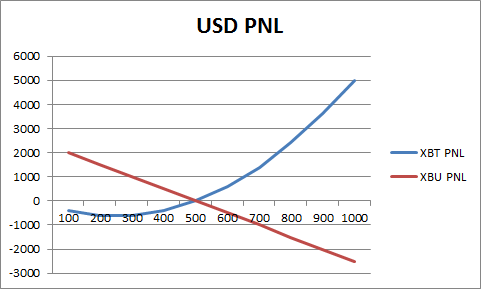 The red line shows the PNL from the long 1,000 XBTUSD contracts. 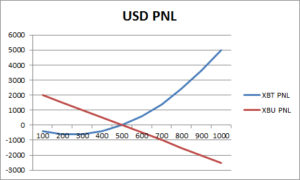 The green line shows your net equity after netting your PNL. Your account actually goes into negative equity a.k.a. bankruptcy as the price drops below $300. 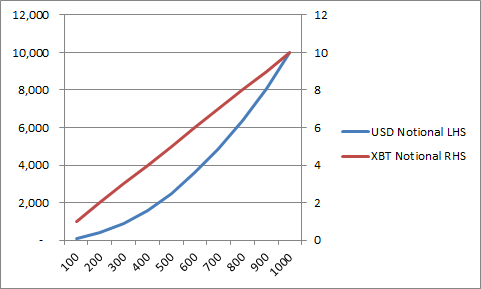 Because XBTUSD is an inverse contract, when you buy 1,000 contracts you are actually short USDXBT – not long XBTUSD – and as a result when the XBTUSD price drops, your account can be margin called even if you deposited the full XBT notional value of your position. 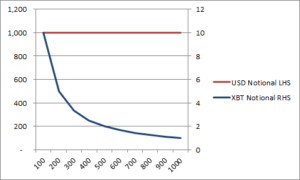 The chart above displays the USD and XBT exposure of being long 1,000 XBTU16 contracts as the XBTUSD spot rate changes. The XBT exposure changes linearly with respect to XBTUSD. 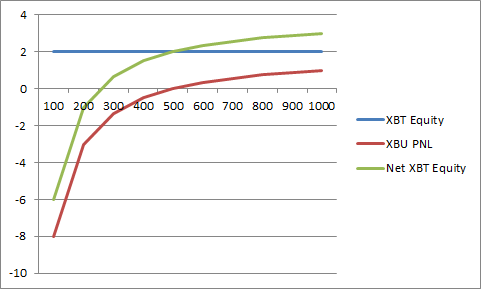 The USD exposure changes in a non-linear fashion because the Price variable is squared [USD value = Price² * 0.00001 XBT * Contracts]. One chain is clearly better than the other depending on your view of future XBTUSD prices. 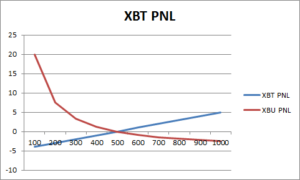 The two charts above show the XBT and USD PNL assuming a portfolio of long 1,000 XBTU16 contracts and short 2,500 XBTUSD contracts both at a price of $500. At $500 the XBT and USD value of the two products is equal. If you have a bearish view on the XBTUSD price, going short XBTUSD is the optimal strategy. 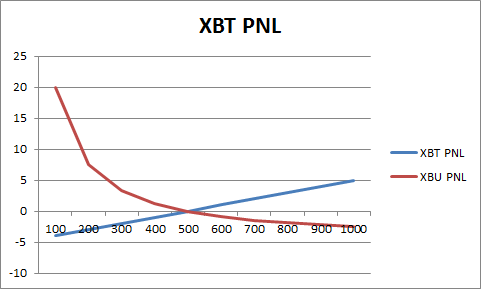 If you have a bullish view on the XBTUSD price, going long XBTU16 is the optimal strategy.